In Syria, the battle for the province of Idlib has begun. Over the course of the past few years, the remnants of the hardened fighters have retreated to this region on the Syria-Turkish border, where they have been under the overall command of an al-Qaeda inspired group. There is no disagreement that this will be a very bloody battle. My report on these developments ends with the following sentences, ‘Those who listen to the sound of the bombs fall are stuck in a circular debate: all acceptable solutions for the end of this war are unrealistic and all realistic solutions are totally unacceptable’. The battle for Idlib will displace many Syrians, who will likely head towards the Turkish border. There are already about 3.5 million refugees in Turkey. The Turkish forces have now amassed on their side of the border and in the enclave which they have carved out in northern Syria. They are ready for the flood of people. Turkey’s president has threatened to invade Syria if the fighting escalates. Such an invasion would either intensify the fighting or put off an inevitable clash in Idlib. There will be displacement of people in the short-term. No good choices are before the various parties to this dispute. The United Nations says that there are 68.5 million people around the world who have been forced from their homes. That number is large. If these people were in one country, it would be the twentieth largest country in the world–ahead of the United Kingdom and Thailand, just behind Iran and Germany. Many of these people are displaced but live within their countries of origin, although too large a number are forced to flee across their borders. We speak of this as a ‘refugee crisis’. In fact, it is not a refugee crisis. It is a crisis of humanity. So rarely do we attend to the trauma experienced by the refugee–and of the economic migrant. From my former colleagues in Beirut comes a project to listen to the narratives of refugees themselves, a project called Refugees as City-Makers. I have slowly begun to read the many stories in this free PDF–which I recommend that you download and savour. In a wonderful (three and a half minutes) video, at Al-Jazeera Shorts, the journalist Preethi Nallu introduces us to 11-year-old Abuzar from Afghanistan who travelled on his own to Serbia. ‘This is the last border,’ he says, hoping to make it to northern Europe. The video ends–poignantly–with the news that he has not been heard from since March 2017. Inside a cyclone shelter inhabited by Rohingya refugees. The photo was taken by the Bangladeshi photographer Shahidul Alam, who remains in prison for documenting protests in his country. 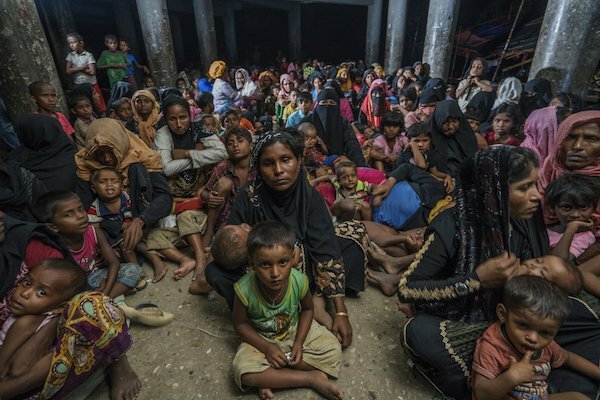 The picture (above) is from inside a cyclone shelter, which is now inhabited by Rohingya refugees. It was taken by the Bangladeshi photographer Shahidul Alam, who remains in prison for documenting protests in his country. His camera is not a mirror of reality, as Brecht said, but a hammer to shape the world. No wonder the government fears someone like Shahidul Alam. They bring the stories of the Rohingya women and the Afghan boys to the world. Please read my essay on Shahidul Alam’s art and what art means in these times of extreme tragedy. A painting by Shamisa Hassani on a street in Kabul commenting on the reality of guns and the hope of music. Shamisa Hassani teaches art at the University of Kabul (Afghanistan). 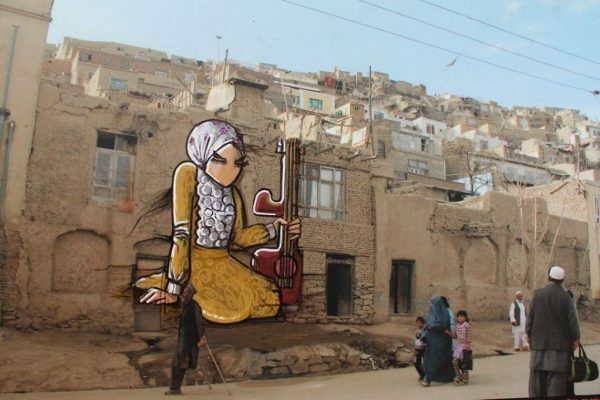 One can find her work in the streets of Kabul, tucked away in lanes and even adorning pot holes on roads. The painting above is by her. It is a comment on the reality of guns and the hope of music. The people who walk by the painting mirror the reality of her depiction–a man with one leg, likely a war veteran, and children with their mother, the future before them. The U.S. war on Afghanistan continues. No longer is it clear how many have died in the country or have had their lives destroyed. On September 11, a U.S. army veteran who fought in Afghanistan on two tours wrote in the New York Times, that the entire war has been misplaced. ‘End the war’, he wrote. It is this war that sent young Abuzar to Serbia. It is the scale of this war that has provoked such mayhem from North Africa to China and beyond–sending millions of people on the march from their burning homes. There is no refugee crisis. There is only the crisis of humanity, a crisis of war and hunger that drives refugees. There is a crisis of humanity in the way people are forced to starve (from our office in Johannesburg, Vashna Jagarnath writes about just this). There is a crisis of humanity in the way merchants of death sell weapons (as shown by this latest CodePink report) and by the way soldiers and the police train other soldiers and the police to treat other humans with harshness (as shown by this latest Jewish Voice for Peace report about Israeli training of the U.S. police). There are no refugees. There are only people who have been forced from their homes. Rafael Correa drawing attention to Texaco’s environmental crimes. Correa’s hand is thickly covered in oil residue, which saturates the Ecuadorean earth. It is beyond doubt that large parts of the Amazon in Ecuador have been devastated by the oil extraction techniques of Texaco from 1964 to 1992. That devastation has created its own exodus. Not long after Texaco quit the country, Ecuador’s government signed away the right to sue U.S.-based companies. This signature was very costly. Indigenous people of the region tried to sue Ecuador. Then, in 2006, Ecuador’s left-leaning government sued Chevron–which had bought Texaco in 2001. 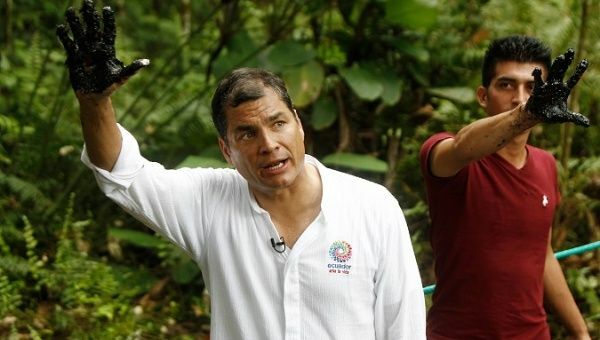 The environmental damage had been wrought before the bilateral agreement, which is what the left-leaning government of Rafael Correa argued in the arbitration court in The Hague (Netherlands); Correa is pictured above, his hands with the thick oil residue that saturates the Ecuadorean earth. Ecuador’s lawyer, Pablo Fajardo, said early on that the ‘system of international arbitration is designed to protect corporations’. Not only did Ecuador lose the case, but the current government–under intense U.S. pressure–has decided to pay reparations to Chevron to the tune of $9.5 billion. The impoverished country of Ecuador–with a GDP of $103 billion-will pay Chevron–net worth $190 billion–money for destroying its environment. One the key ministers in Correa’s government–Andrés Arauz (the Deputy Secretary for Planning and Development and the Minister of Knowledge and Human Talent) offers a wonderful summary of the core issues and of the politics of the surrender of the current government of Ecuador. The shift in the balance of forces in South America is precisely responsible for the capitulation of the current government of Ecuador. When the political needle leaned leftward, the government of Ecuador was strong enough to challenge Chevron in international courts; when the needle swung rightwards, Ecuador lost its nerve and voted with the monopoly firms. Our loyalty, mine, Haddad’s and Manuela’s, is with the people in the first place. It is with the dreams of those who want to live again in a country in which all have food on the table, in which there is employment, decent wages, legal protection for those who work; in which the children have schools and the youth, a future; in which the families can afford to buy a car, a home, and keep on dreaming and achieving. A country in which all shall have opportunities, and no one shall have any privilege. If Haddad and d’Avila are able to prevail over the bloc of the oligarchs, then the political needle will shift in South America. It will be a boost to the forces of the people if this were to happen. South America’s hope rests on Brazil (please go back and read the Tricontinental: Institute for Social Research dossier on Brazil, which we published in June). 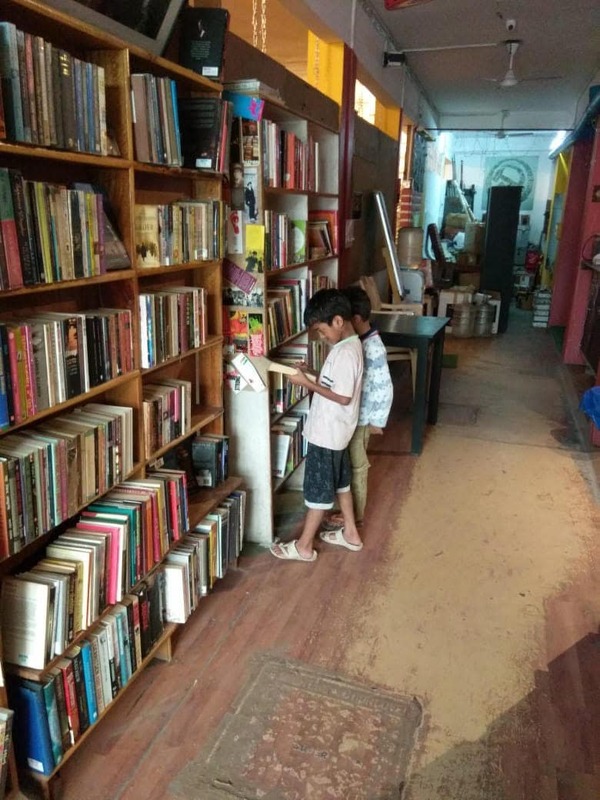 Meanwhile, from our little enclave in New Delhi–May Day Bookstore (right)–and LeftWord Books comes the letter from my colleague Sudhanva Deshpande and myself (wearing my other hat, as Chief Editor of LeftWord Books). We offer a little report on the new books we have published–a volume that selects the writings of Lenin and a volume that selects the stories of my Frontline colleague Shujaat Bukhari, who was assassinated earlier this year. We also write about the difficulties of a small publisher and find ways for you to support us with your voluntary labour. Please read our letter here. Below is our week’s illustration–this one of Amilcar Cabral (1924-1973). Cabral was central to the Tricontinental Conference in Havana, Cuba in 1966. At that conference, Cabral delivered a lecture entitled ‘The Weapons of Theory’, in which he made the pithy observation, ‘In our own times, with the progressive domestication of atomic energy it is possible to promise, if not to take men to the stars, at least to humanise the universe’. 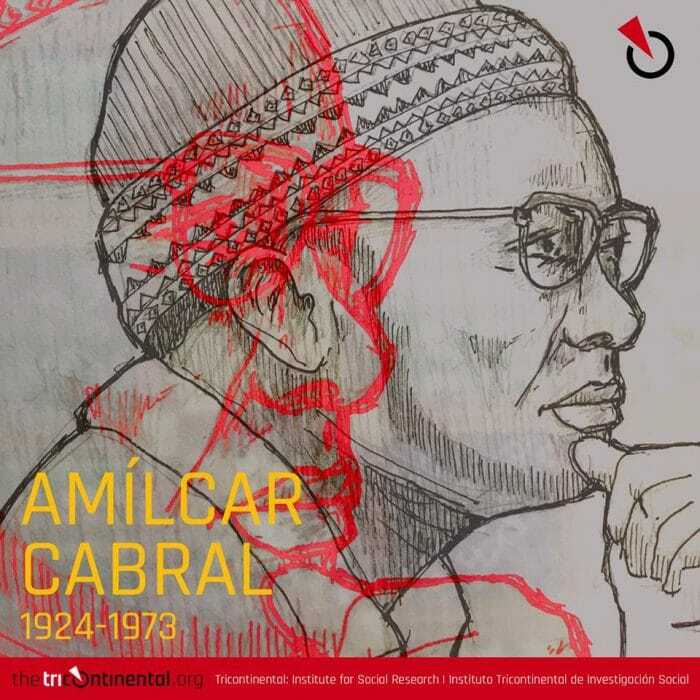 Illustration of Amilcar Cabral (1924-1973) by Tricontinental. As I write these words, I hear that the Algerian-French singer Rachid Taha (1958-2018) has died. One of his great songs was Ya Rayah, written by Dahmane El Harrachi. ‘Ya rayah win msafar trouh taaya wa twali’, sings Rachid Taha, ‘Oh, where are you going? Eventually you must come back’. It is the song for the traveller, the one who goes on the road. It is a song of sorrow, a song of longing for a better life and for home, a song that wonders if on the road outwards the wanderer will find humanity.